My tales of exotic Seoul are sadly few and far between. In fact I've spent most of the conference not being able to get out of bed. Having finally seen a doc today who was willing to take a look at me I've been diagnosed with laryngitis, pharyngitis and rhinitis, which could explain why I haven't been feeling on tip-top form. My throat is currently so swollen that they felt it necessary to pass a camera up my nose and down my throat to have a decent peek, not something that I'm particularly keen on repeating. Anyway, with a few days worth of antibiotics I should be better soon. This doesn't recover the lost days from this week and those in the coming days that I've been so looking forward to for the last couple of months. Anyway, I'm going to attempt to stay reasonably positive, though that may make this a rather short post. We're a 45 minute commute from the KIAS which isn't a great arrangement, so to get to lectures on time we have to get up pretty early every morning. There have been some great lecturers here including talks by Ooguri on calabi yau geometries and topological strings culminating in the OSV conjecture and a nice set of talks by Sugimoto on his D4D8D8bar construction of chiral symmetry breaking. In many ways it's very different from the models of chiral symmetry breaking I've worked on in the past with some very positive aspects (you start with a full U(Nf)L x U(Nf)r symmetry) and some rather troubling points (I'm not sure there's any way of introducing finite mass quarks into the picture). I'd like to talk in detail some time about the difference between this D8 flavour model and the D7 flavour models I've worked on. What was particularly interesting was hearing some of the questions about these sorts of models from somebody who comes from a deeply stringy background, Ooguri amongst others, and hearing questions that with my background I usual wouldn't consider. Unfortunately apart from a couple of talks by Ashoke Sen and Spenta Wadia I simply haven't been able to stay awake for more than ten minutes at a time in the lectures. I've just been lying in the accommodation flicking between repeats on the Discovery Channel and unintelligible Korean game shows. The language sounds to me a little like Japanese spoken with a Welsh accent, a strange combination indeed and I'm not going to get a chance to learn more than a few basic words. The writing system is a compact alphabetised one and from sitting on the train for a few commutes one can learn most of it from studying the transliterations of the stations. It hadn't occured to me that I might actually miss speaking Chinese but the realisation that it's going to slip quite substantially in the 10 weeks I'm away is quite a shock. I now speak a reasonably amount of Chinese every day in various situations and I'm quite comfortable with the (very) little I have mastered. I'd love to be able to write more about the food but apart from some street food and meals in the canteen I've been limited to popping out to get meals from the local convenience store. 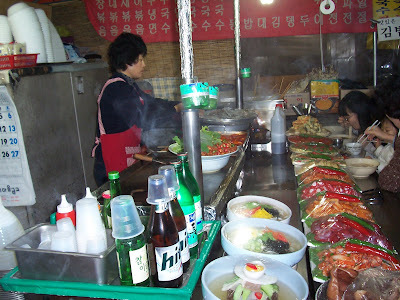 One of the staples of the Korean diet is kimchi, a pickled cabbage dish which is often rather spicy. The food seems to be extremely healthy (other than some of the street food, including what appears to be battered deep fried chips on a stick) with lots of vegetables and fish, plus extremely small portions. That, sadly is about it for cultural commentary, apart from the fact that every Korean music video I've seen ends up with one half of a couple falling of a cliff or being blown up. I'm not sure what that indicates about the national psyche. Anyway, a couple of photos from the times I have made it out of the guest house. 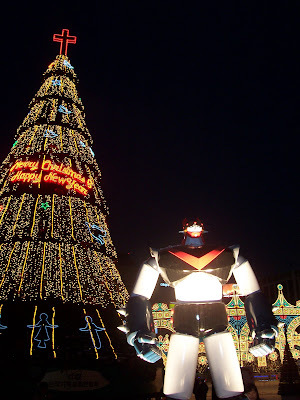 This rather strange display of Christmas lights and giant transformer greeted me as I made my way to the accommodation on the first day. I popped out for street food having failed miserably to get anything in a restaurant. Some good soup, tasty sushi and Korean fried dumplings went down a treat. Though I've been told to rest up (and not talk) I don't have a choice but to go on the bus tomorrow to the ski resort where I shall not be getting any skiing done. It may be that we have no internet access for the next week so apologies to anyone for e-mails I don't get a chance to reply to for a week or so. £5 return to Spain. That's cheaper than a return tube from Leicester Sq to Covent Garden which is, I believe, a whopping 200m round trip. Glad you're on the mend. Am I right in thinking you're going to be fairly near to the Bay Of Biscay, Biscuit? Let the jokes commence. Sorry you're feeling ill, but congrats on the postdocs! GG, good news about the flights. It'll be nice to be that much closer to home. It's going to be 18 months without going home by the time I come back in November which feels like quite a haul. Presumably on top of that 5 quid is a ride on the tube plus a bus to the airport, doubling or possibly tripling the overall cost. Hmm - good point. The tube will be covered with a season ticket but getting to the airport is a different matter. Will have to look into that. I think a return to stanstead is about 15 big ones. Massive. Cute pic of that tilted transformer beside the Christmas tree, u don't see those often. hahaha... Well hey, get well man~ hope ur throat's beter. Don't know if you've heard yet, but we have to be careful eating pork now too. No wonder so many people are getting sick; even the meat we eat are contracting diseases. Thanks for the note. I hadn't heard about the pork, can you tell me more? I presume that it's porcine encephalitis which has been a problem for a long time as far as I know (I seem to remember it's also called Japanese encephalitis but this is trawling the depths of my memory). I think that you want to steer clear of eating the brain. I've only tried it once in a hotpot and rather liked it but have not had it since because of the possible risks. hmmm... hah~ Good to know!